This page shows the 'James's' Universal Ointment pot originating from Birmingham, in the West Midlands. 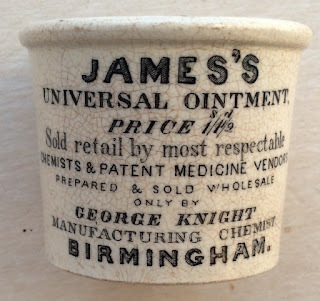 George Knight, based in Birmingham, is stated as being the Manufacturing Chemist and the wholesale retailer of the James's Universal Ointment. He was in business at 19, Congreve Street, Birmingham and is listed in 1853 and 1854 only. Two sizes of this pot are known, one showing a price of 1s 1½d and the other a larger size with a price of 2s 9d. An article regarding the James's pot appears in BBR magazine no. 77. If anyone has the larger size that that would like to sell, please Contact Me. This image shows the two sizes of the pots. book produced by Messrs. Houghton & Priestley page 95.